Carbon Tax: A Free Market Solution to Climate Change? Proponents of a U.S. carbon tax have been coming out of the woodworks for years, and many economists will argue that a “revenue-neutral” carbon tax is the optimal policy solution to combat climate change. But is a carbon tax actually a free market solution to climate change? According to a recently published paper by the Texas Public Policy Foundation, the answer is no. A carbon tax is often called a free-market approach to reducing the negative externalities, or social costs, of CO2 emissions while causing consumers little harm. In reality, a carbon tax would drastically increase the price of every good or service that requires the use of energy, which is essentially everything. The Australian carbon tax, one of the most commonly cited examples of a “model carbon tax,” caused the largest-ever quarterly increase in consumer energy prices in Australia’s history. The initial cost was $23 per metric ton of CO2 equivalent emitted into the air, which was increased to $24.15 per metric ton a year later. The program was so unpopular that it was ended in July 2014, just two years after it was implemented. The U.S. Treasury estimated that a tax of $49 per ton of CO2 emissions would increase oil prices by $21/barrel and natural gas prices by $2.60/mcf. There’s no doubt about it: price increases that massive will cause consumer electricity prices and gasoline prices to spike, harming Americans, especially those least able to afford it, in the process. Additionally, there’s little conclusive evidence to prove that carbon dioxide emissions from human activity are causing great environmental harm and justify any policy responses at all. 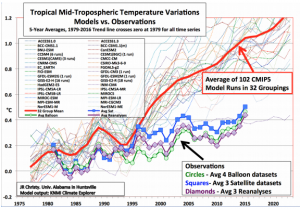 Many leading atmospheric scientists say that our current environmental models are too inaccurate to provide reliable predictions of the effects of rising CO2 levels. For example, Figure 1 compares the predicted global temperatures from 102 runs of a widely used climate model to the actual observed data. All one has to do is take a cursory glance at this comparison to call the scientific community’s “consensus” into question; the estimated average increases were more than 2.5 higher than actual temperatures. In contrast, there is significant empirical data showing carbon dioxide emissions are associated with improved quality of life. 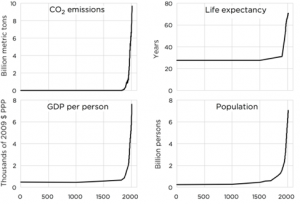 Figure 2 shows the massive increase in GDP per capita, population, and life expectancy that is associated with increased CO2 emissions. Other research finds that there is a 95 percent correlation between increasing use of fossil fuels and rising economic growth over time. There is also an 83 percent correlation between rising CO2 emission levels and average life expectancy at birth. In summary, the proposed “free-market” carbon tax is, by definition, not a free market solution. The tax would unduly burden American consumers with increased electricity and gas prices. Finally, perhaps most importantly, there is little to no evidence that there is a need to reduce carbon emissions in this country. For all of these reasons, and many more, proposals for carbon taxes should be wholeheartedly rejected. Even the low estimates of the carbon tax required to meet current international climate change goals would more than double oil and gas prices.